A devastating earthquake has hit the coast of Japan, with fears for the safety of nearby nuclear power stations.The 7.4 magnitude quake hit on Tuesday, just off the coast of Fukushima, which was also the site of the 2011 9.0 scale earthquake. The Japan Meteorological Agency have said that this new quake was actually an aftershock from the previous one, and have warned that further aftershocks could follow. The 2011 quake was catastrophic in it's destruction, killing 15,891 people, with a further 2,584 missing. It destroyed countless homes and ruined people's livelihoods. The fear that these quakes will cause a huge problem in the nuclear power sector is very real. About 30% of all Japan's power comes from nuclear power stations, many of which are located on the coast where the earthquakes tend to strike. The 2011 earthquake catastrophically damaged 3 of 6 nuclear reactors at the Fukushima Daiichi facility, the extent of the fallout from this has never been fully identified. One repercussion of this has been the pollution of radioactive waste into the sea. It is thought that hundreds of tons of radioactive waste has been pumped inot the sea every day ever since. 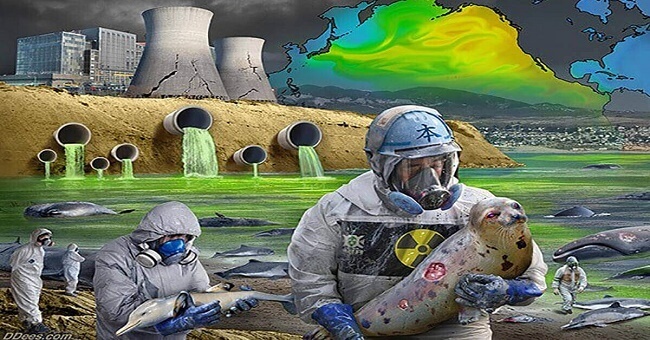 The nuclear waste has penetrated the Japanese food chain and has been detected in food over 200 miles away. In 2015 Akira Ono the chief of the Fukushima power station said that there was no known way of decommissioning the power station and stopping the waste leakage. Officials have claimed that while there is a definite leakage, they say it is not doing any actual harm to the environment, but the stats claim another story. American scientists have been study what is effectively the 'death' of the pacific, where marine life is dying off at an alarming rate. Krill, one of the key players in the sea-life food chain has been found washed up in vast numbers, and bodies of seals and sea lions are repeatedly washed up on shores. USA Today ran a story of starfish being washed up that had seemingly turned to 'mush', the reason to which they said left them 'baffled'. It has also been reported that a staggering 98% of the sea floor is covered with dead sea life. It's time people woke up to the reality of what is happening. In our lifetime we have already seen so many species become extinct on land, and now humans are destroying the sea, too.